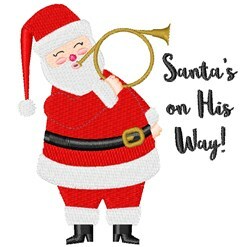 It's time for merriment because Santa Claus is coming again! Spread Christmas cheer with the colorful design on pillows, wall hangings, totes and more! Hopscotch is happy to present Santa On His Way machine embroidery design which has 11934 stitches and is [90.79 mm x 100.50 mm] large. If you would like to view more embroidery patterns please search on our embroidery designs page.